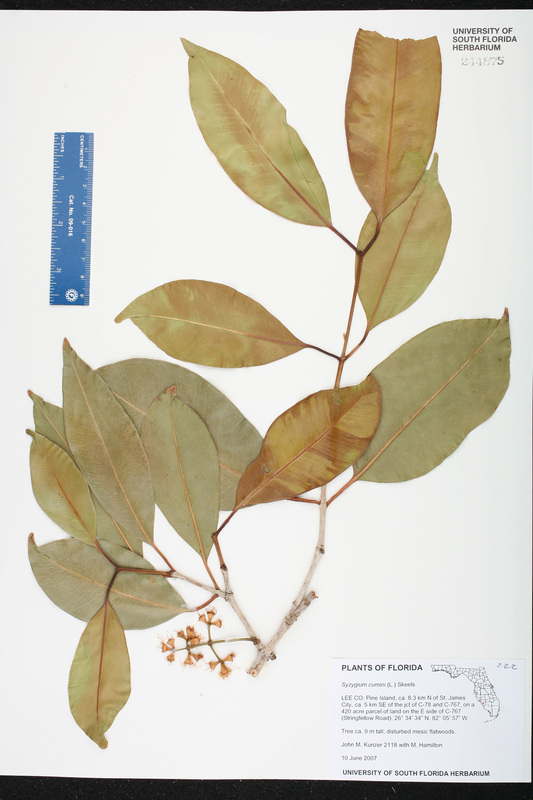 Citation SYZYGIUM CUMINI (Linnaeus) Skeels, Bull. Bur. Pl. Industr., U.S.D.A. 248: 25. 1912. 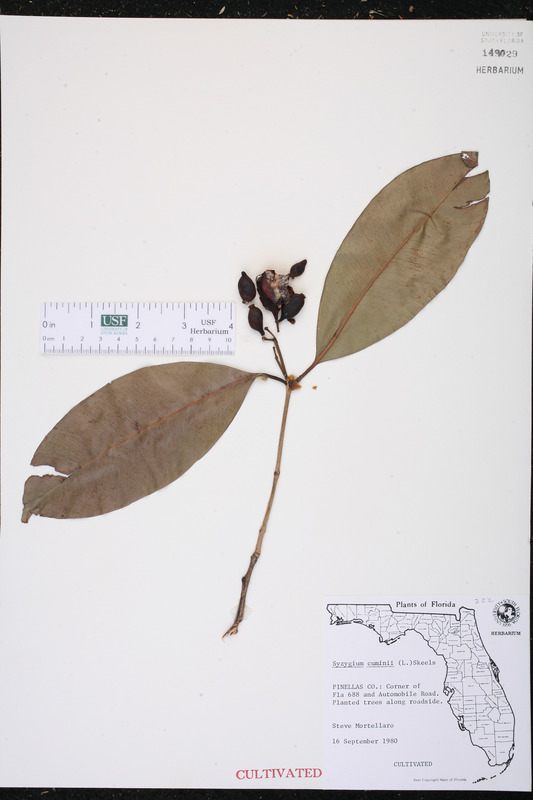 Basionym: Myrtus cumini Linnaeus 1753. 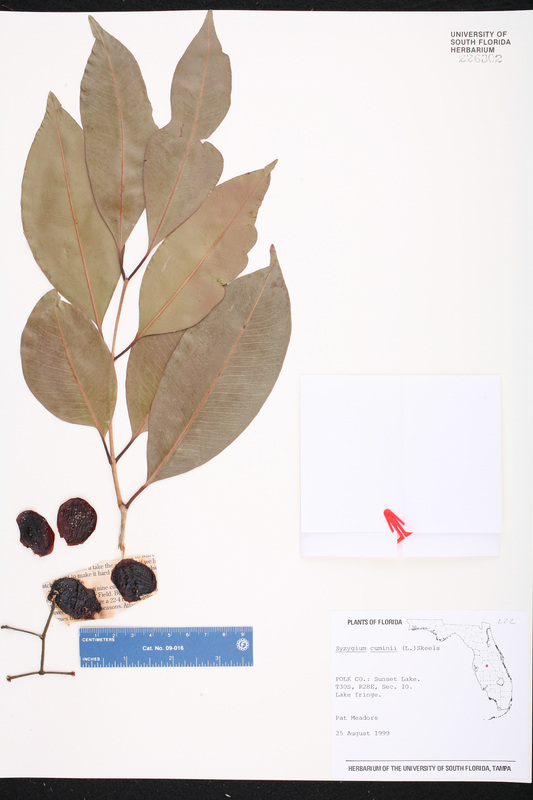 Type: SRI LANKA: Without data, Herb. Hermann 1: 45, no. 185, right spec. (lectotype: BM). Lectotypified by Verdcourt, in Beentje, Fl. Trop. E. 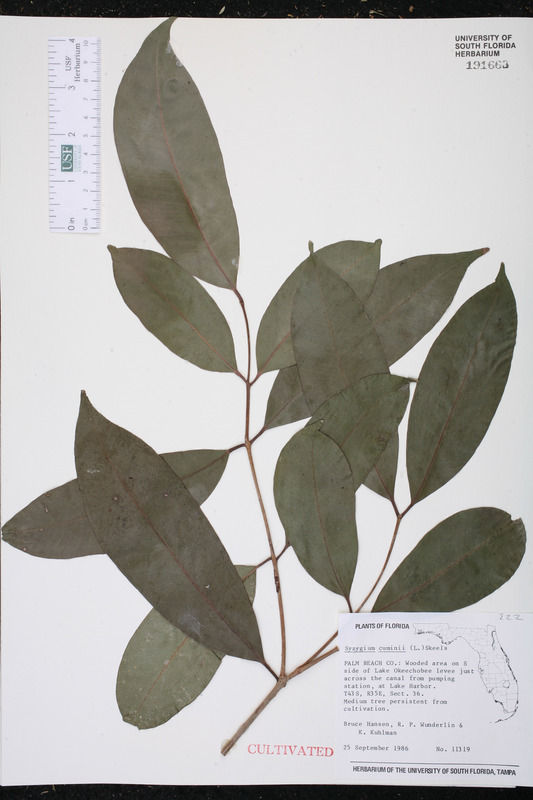 Afr., Myrtaceae 72. 2001. 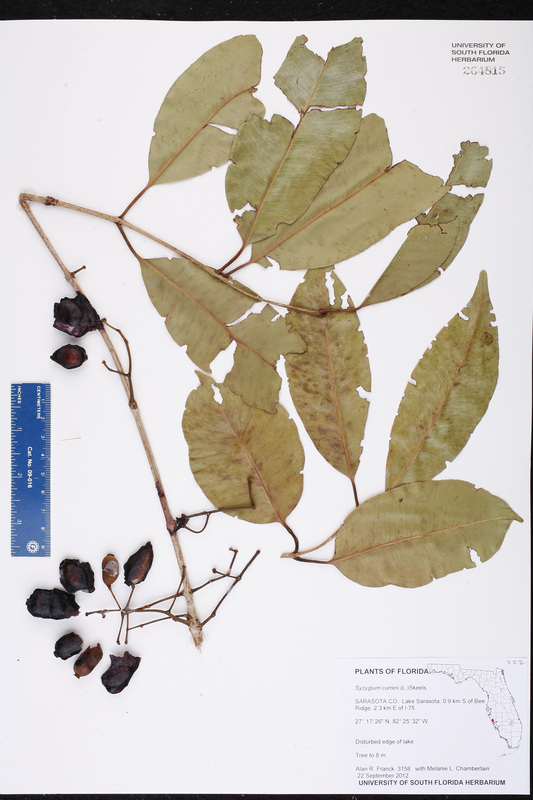 Eugenia cumini Eugenia cumini (Linnaeus) Druce, Bot. Exch. Club Soc. Brit. Isles 3: 48. 1914. 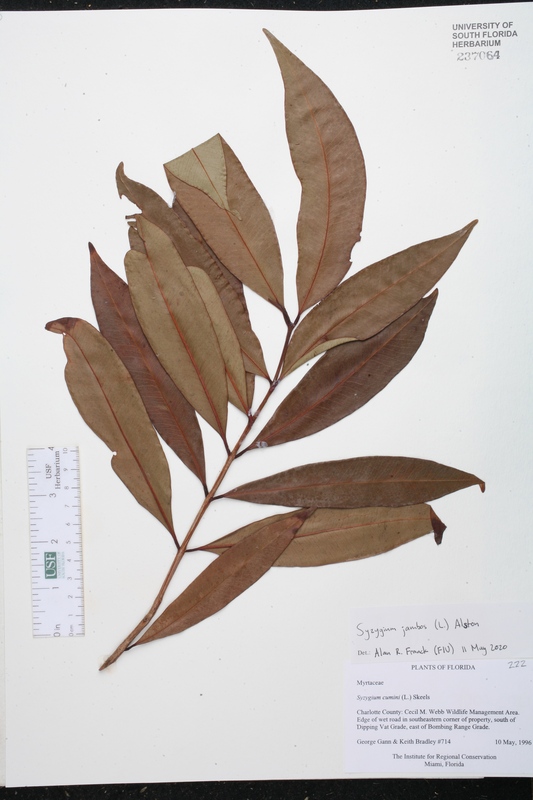 BASIONYM: Myrtus cumini Linnaeus 1753. 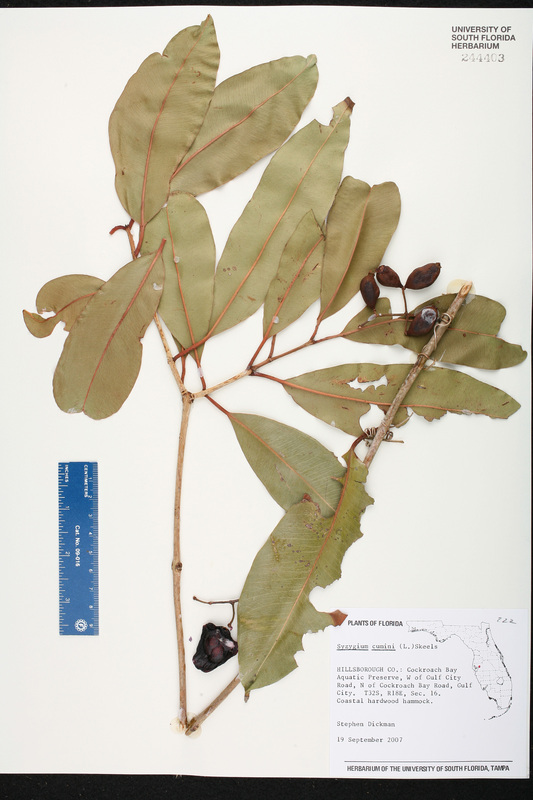 Myrtus cumini Myrtus cumini Linnaeus, Sp. Pl. 471. 1753. TYPE: SRI LANKA: Without data, Herb. 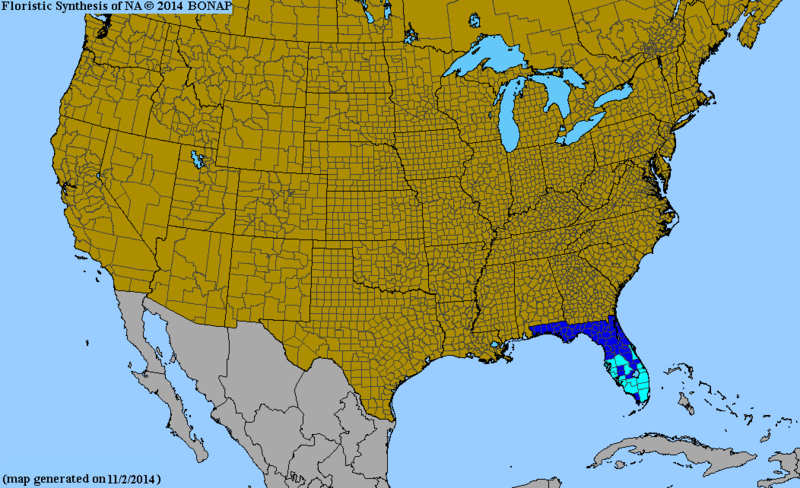 Hermann 1: 45, no. 185, right spec. (lectotype: BM). 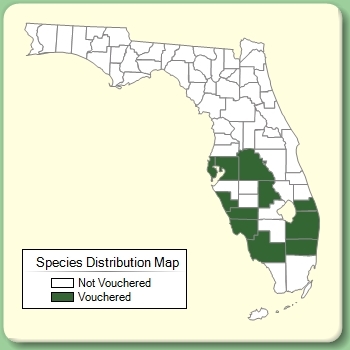 Lectotypified by Verdcourt, in Beentje, Fl. Trop. E. 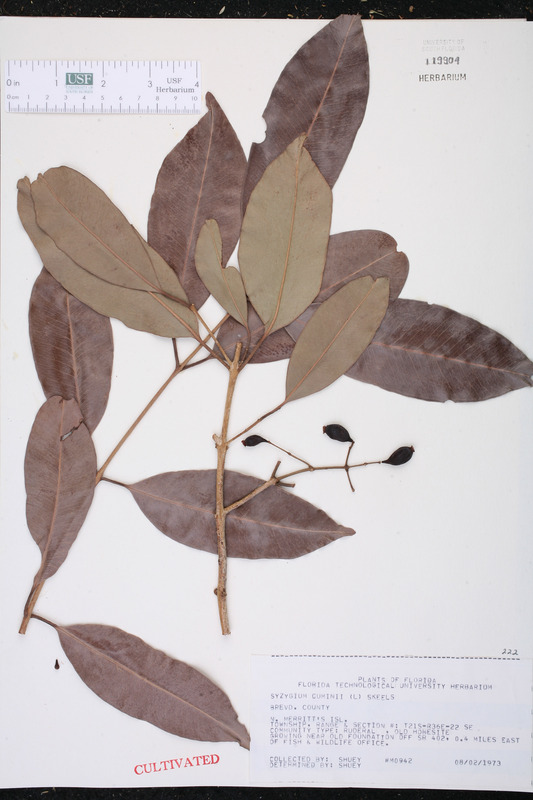 Afr., Myrtaceae 72. 2001. 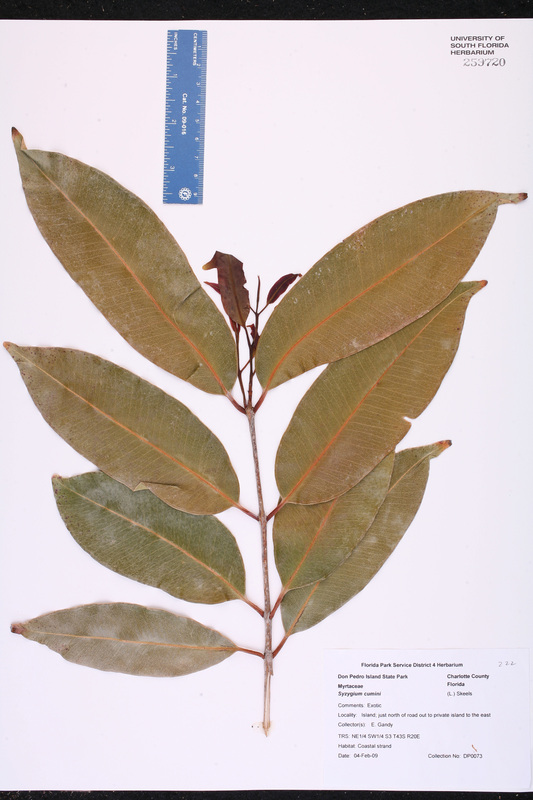 Calyptranthes caryophyllifolia Calyptranthes caryophyllifolia (Lamarck) Willdenow, Ann. Bot. (Usteri) 17: 22. 1796. 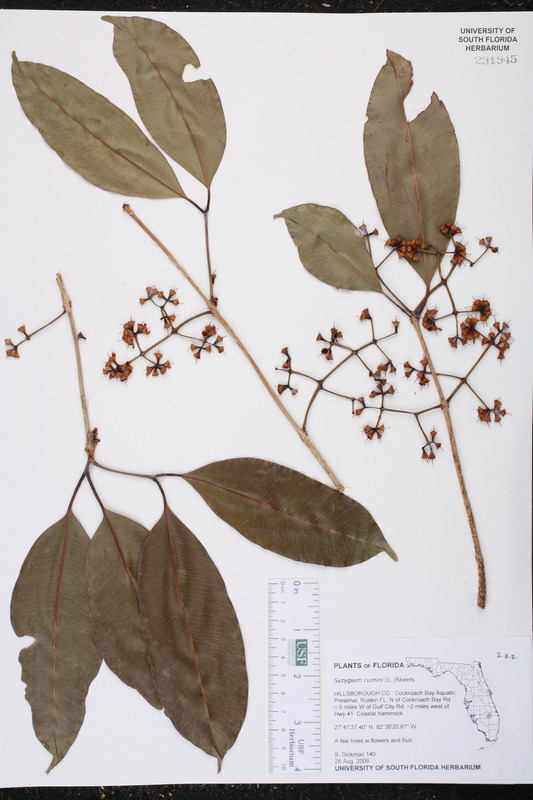 BASIONYM: Eugenia caryophyllifolia Lamarck 1789. Calyptranthes oneillii Calyptranthes oneillii Lundell, Bull. Torrey Bot. Club 64: 554. 1937. TYPE: BELIZE: Belize Distr. : Ca. 7 mi. 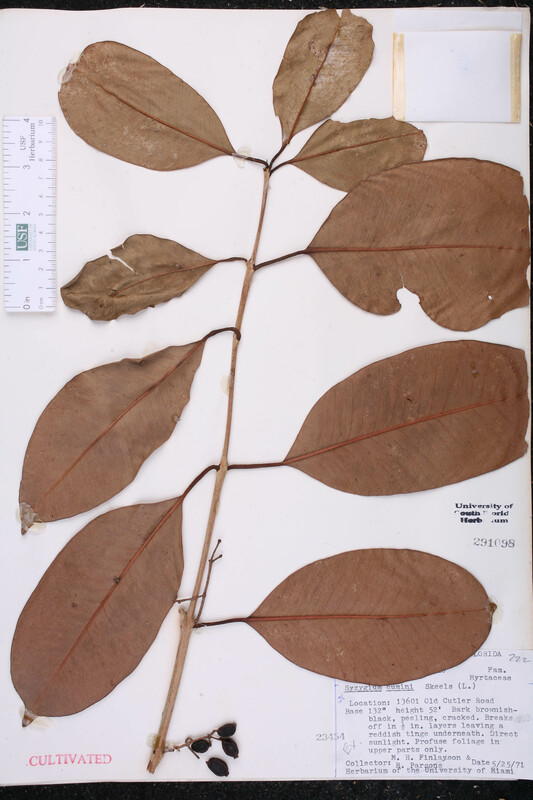 NW of Belize, 21 Aug 1936, O'Neill 8764 (holotype: MICH). 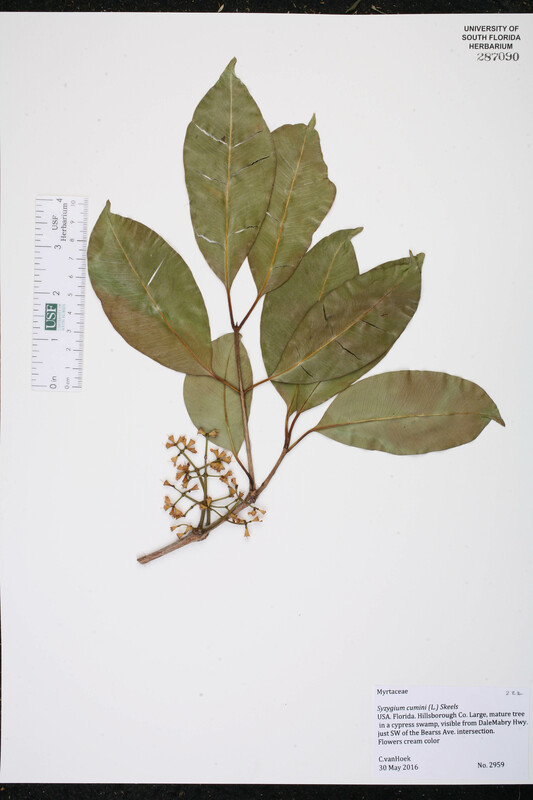 Eugenia caryophyllifolia Eugenia caryophyllifolia Lamarck, Encycl. 3: 198. 1789. 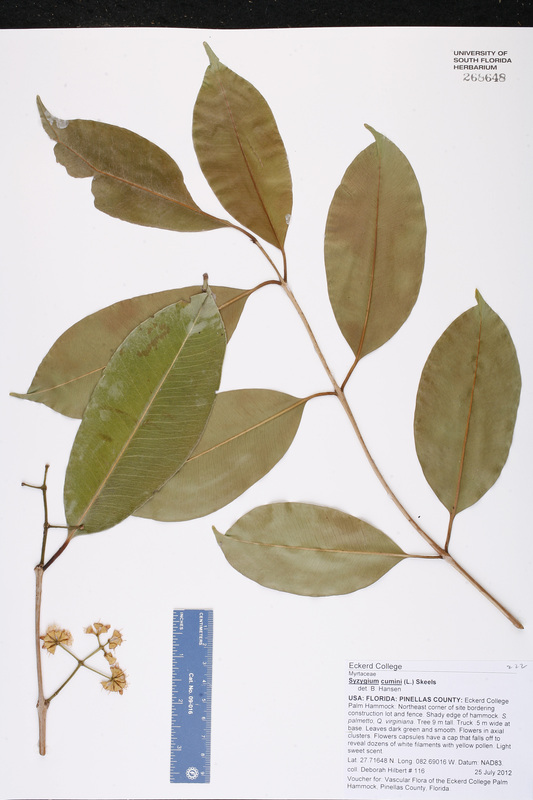 Eugenia jambolana Eugenia jambolana Lamarck, Encycl. 3: 198. 1789. 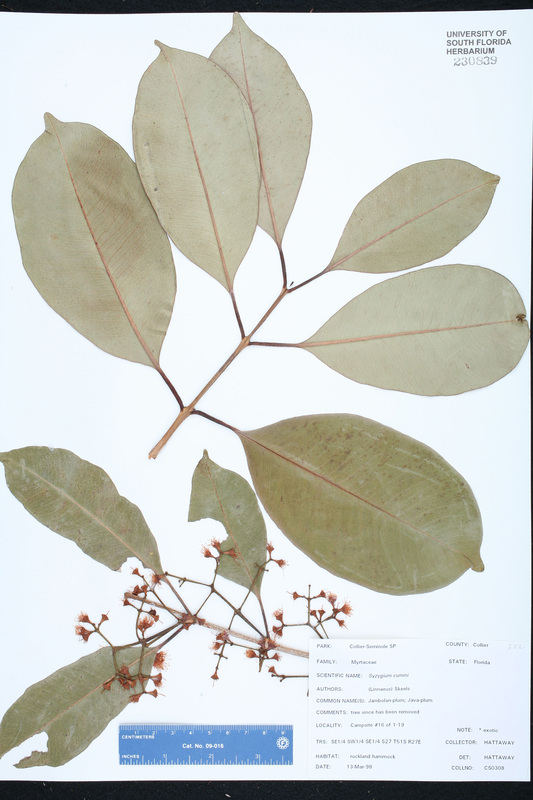 TYPE: East Indies, without data, Sonnerat s.n. (lectotype: P). 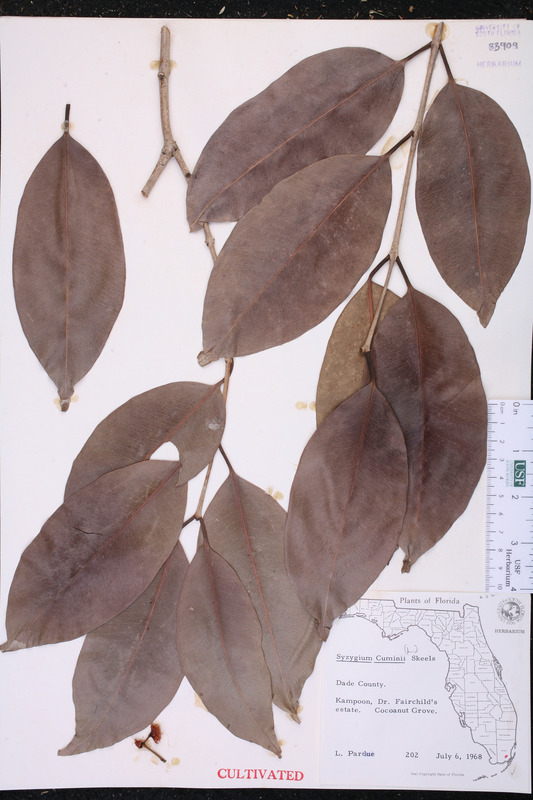 Lectotypified by McVaugh, in Howard, Fl. Less. 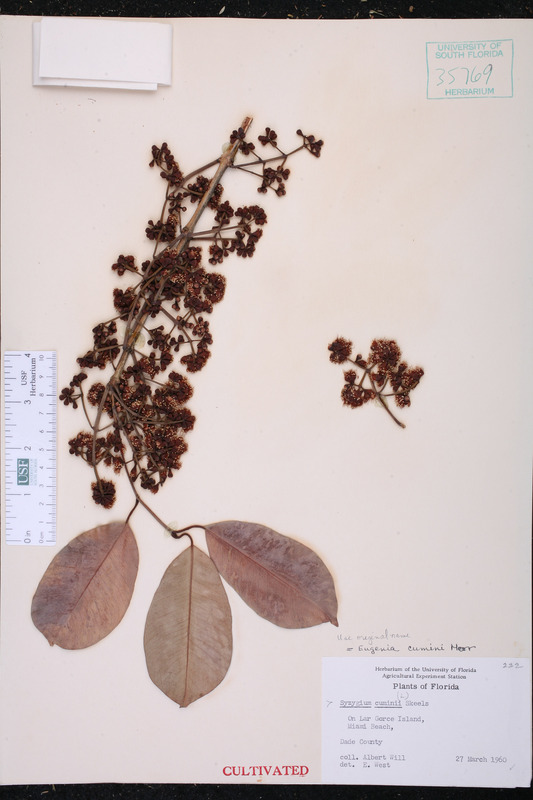 Antill., Dicot. 2: 529. 1989. 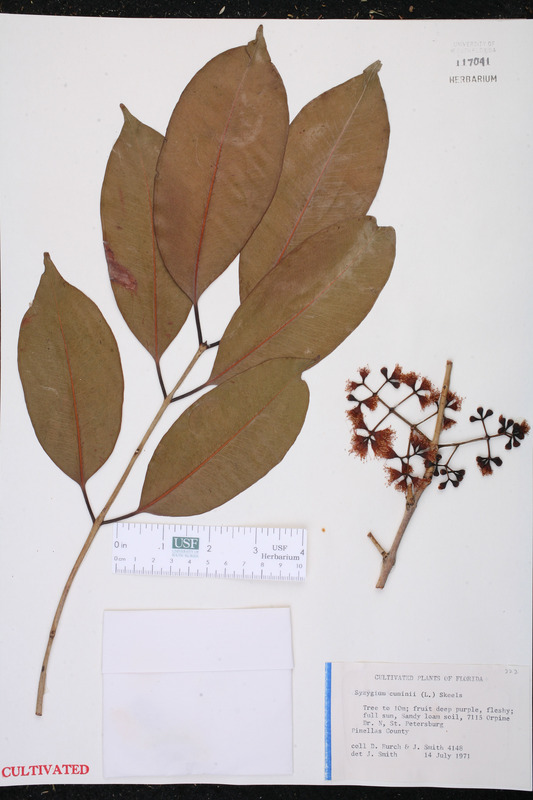 Syzygium caryophyllifolium Syzygium caryophyllifolium (Lamarck) de Candolle, Prodr. 3: 260. 1828. 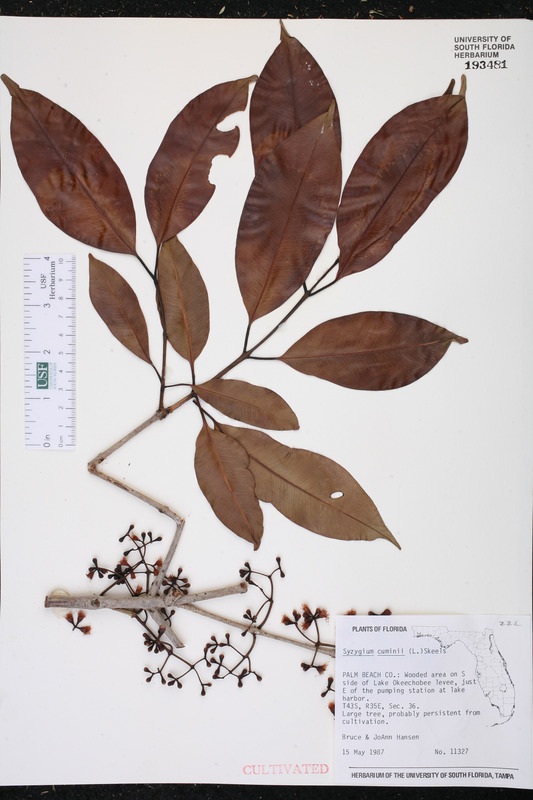 BASIONYM: Eugenia caryophyllifolia Lamarck 1828. 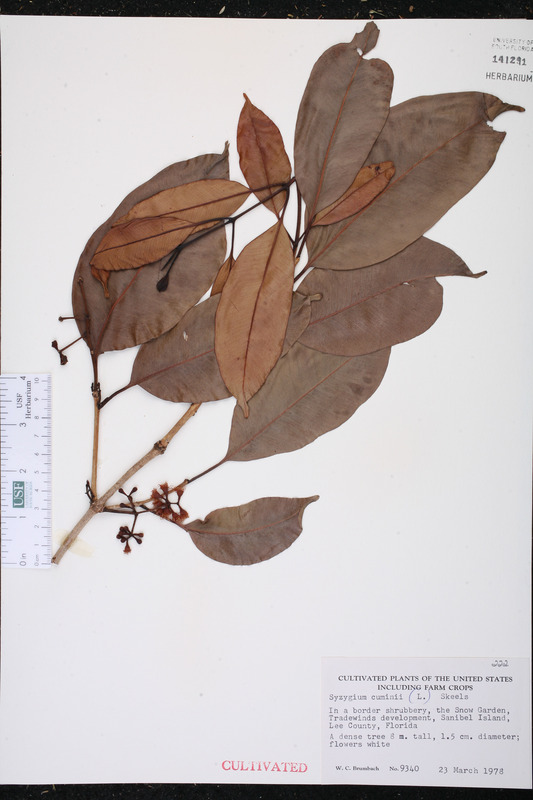 Syzygium jambolanum Syzygium jambolanum (Lamarck) de Candolle, Prodr. 3: 259. 1828. 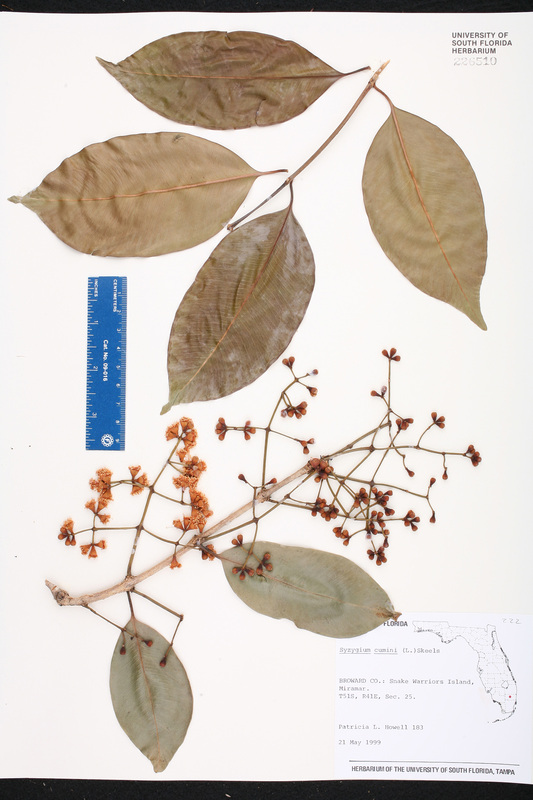 BASIONYM: Eugenia jambolana Lamarck 1789. USA Florida Polk Co. 25 Aug 1999 P. Meadors s.n. 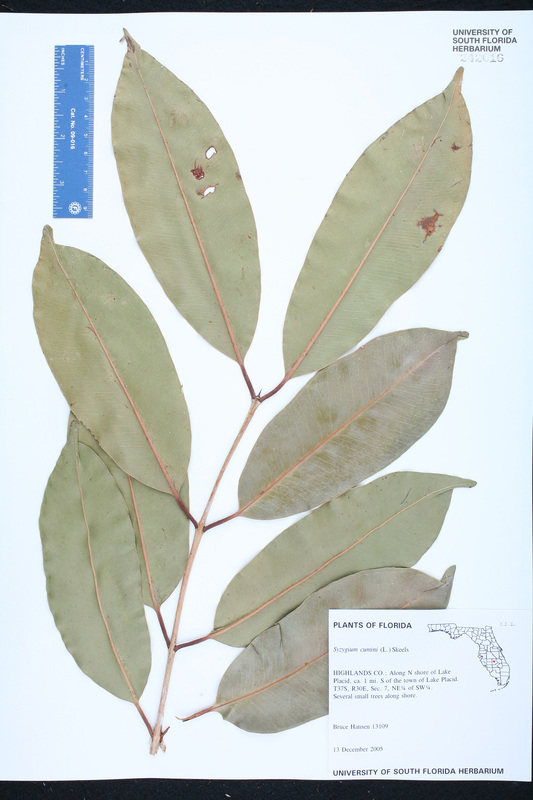 USA Florida Lee Co. 23 Mar 1978 W. C. Brumbach 9340 CULTIVATED. USA Florida Miami-Dade Co. 27 Mar 1960 A. Will s.n. CULTIVATED. USA Florida Pinellas Co. 16 Sep 1980 S. Mortellaro s.n. CULTIVATED. USA Florida Palm Beach Co. 15 May 1987 B. F. Hansen 11327 CULTIVATED. USA Florida Palm Beach Co. 25 Sep 1986 B. F. Hansen 11319 CULTIVATED. USA Florida Miami-Dade Co. 06 Jul 1968 L. Pardue 202 CULTIVATED. USA Florida Pinellas Co. 14 Jul 1971 D. Burch 4148 CULTIVATED. USA Florida Brevard Co. 02 Aug 1973 A.G. Shuey M0942 CULTIVATED. USA Florida Miami-Dade Co. 25 May 1971 M. H. Finlayson 28 CULTIVATED.